In many parties I joined, I found salad was very popular and a favourite dish to most people. This smoked salmon is one of my favourites, either enjoying in social gatherings or making for a light family meal. The smoked salmon used in this side dish was bought from supermarket, very handy, huh. What would happen when the east meets the west? It might come up with some dishes like this one. This time I experimented using Chinese way of marinating chicken instead of just sprinkling a pinch of salt and pepper. The oriental taste of chicken was mingled with Aussie salad greens, subtly adding an Asian kick. The crisp baby spinach was a big hit in my family unexpectedly. My hubby kept asking whether I left some more in the kitchen. Julienne chicken and mix with marinade for 20 minutes. Heat oil in a pan, stir-fry until cooked through. Set aside. Rinse baby spinach and wipe dry. Mix in olive oil, vinegar, lemon zest, garlic, salt and pepper. Taste by yourself and adjust to your liking. Divide on two platters. Remove egg shells and cut into wedges. Place them on baby spinach. Arrange smoked salmon and chicken on top. Enjoy. Adding small amount of crushed garlic and lemon zest makes a big difference in taste of salad. You might like to adjust the amount of vinegar to your personal preference. Choose other salad greens if you like. 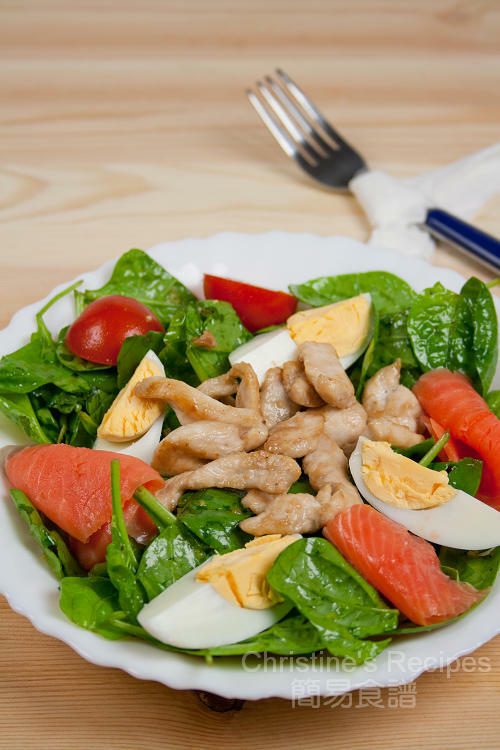 If you prepare this salad for a party, please increase the amount according to your need. your salad is so fresh looking and colourful. I love the vinegar and lemon zest. Yes, I like that Asian touch in salads :) ...I rather have this than mayo dressing. Looks very refreshing, healthy and delicious. I don't like smoked salmon but may change my mind after seeing this. It's so simple to make too. Your salad is so enticing I feel like jumping out of bed and making one right this minute! This is a refreshing and delicious salad. I love smoked salmon and you did a nice twist with it. WOW! This is really refreshing. I love smoked salmon really good to make into salad and sandwiches. Yum! 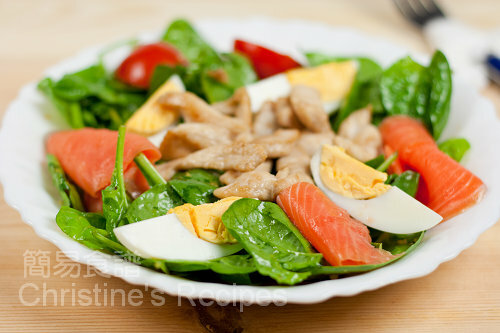 Love smoked salmon and I love chicken pieces in salad too. Gotta have the protein. this looks wonderful I write for an Alaskan Seafood company could I feature this and link back to you? I also love to learn more about seafood. Can't wait to read your post. Happy Easter Day! I've an award for you, please come and pick it up when you're free. Oh wow, this could ba a stand alone dish already. I can't have this only for a side dish! Salmon and chicken breast, tastes so good. The colors of the picture are tempting and mouth watering! Thank you for sharing your recipe! this I want to try!